Page revised in February 2017. The locations covered in this section were visited in March 2009. You may wish to see an introductory page to this section or the pages on the Forbidden City first. Summers can be pretty hot in Beijing which has a continental climate with average high temperatures of 30C/86F in June, July and August; they are accompanied by high levels of humidity. 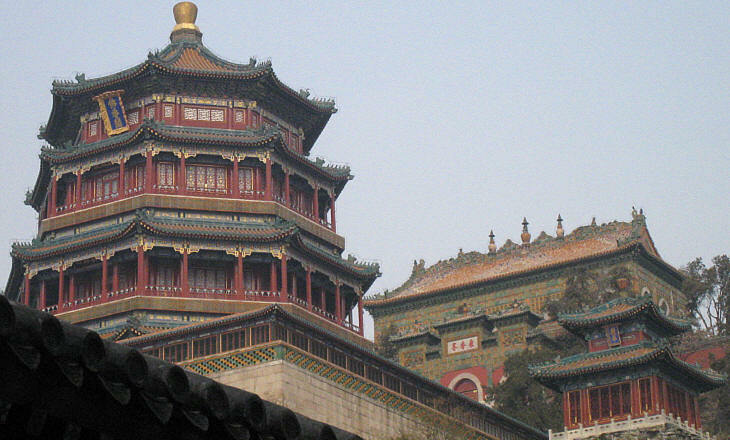 The massive walls surrounding the Forbidden City made it more unpleasant living there for the emperor and his court. In 1725 Emperor Yongzheng started the enlargement of a small summer retreat located a few miles to the north of Beijing's walls. The development of this complex of gardens and palaces did not have to comply strictly with the Fengshui rules which limited the creativity of Chinese architects. Two Jesuits were involved in the design of several buildings where they introduced elements of baroque style. Emperor Yongzheng was aware of the grand residence of King Louis XIV at Versailles and of Schonbrunn castle near Vienna. The gardens of his Summer Palace, which were completed by his successor Emperor Qianlong, covered an area which was almost five times the size of the Forbidden City. In 1860, during the Second Opium War, this summer residence was destroyed by British troops, in retaliation for the imprisonment and torture of two envoys. For this reason the ruins of that residence are known today as the Old Summer Palace. Soon after the destruction of his residence Emperor Xianfeng fell ill and died. One of his concubines managed to become the de facto ruler of the country for more than forty years (1861-1908). She is known as Empress Dowager Cixi; she decided to enlarge and restore a minor retreat relatively near the (old) Summer Palace. This location featured an impressive pagoda and a Buddhist monastery on a hill surrounded by a small artificial lake. 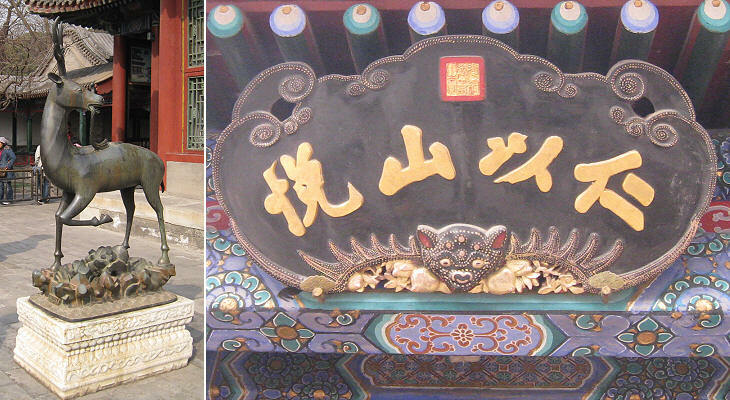 The new Summer Palace was damaged and looted by troops of the Eight-Nation Alliance in 1900. The Empress diverted substantial amounts of money from more important objectives into the reconstruction of the Palace. She died in 1908 and only four years later the last Chinese emperor was forced to abdicate; he was given the right to continue to live in the Summer Palace and in the private apartments of the Forbidden City. The symbolic meaning of numbers influenced the design of monuments, such as the bridge shown above: seventeen is the sum of nine plus eight. The former symbolized the emperor, whereas the latter was and still is regarded as a very lucky number: a Chinese architect would never suggest a four-arch bridge, because number four is a very unlucky number. In this specific case the influence of numbers led to the design of a very elegant bridge which is characterized by the gradual reduction of the size of the arches. The emperors reached the Summer Palace by boat and a long and flat marble boat decorates the landing stage; it is a work of the XVIIIth century and it shows the influence of the Jesuit architects who designed parts of the Old Summer Palace. The paddle wheel and the disproportionate cabin/loggia were added by Empress Dowager Cixi. 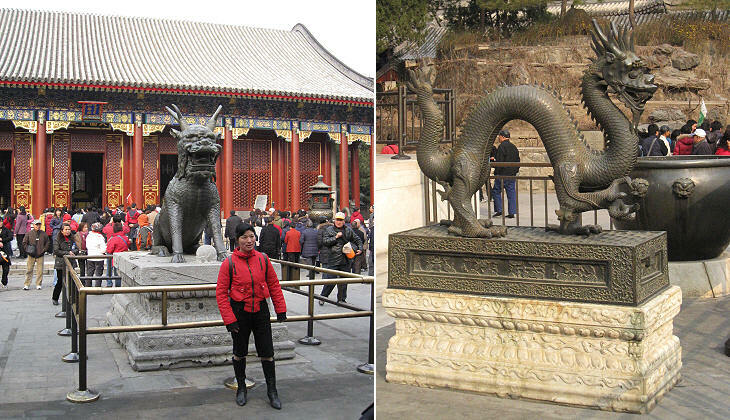 Two bronze statues of mythical animals: that on the left is a "qilin"
By and large most of the statues and reliefs which decorate the Summer Palace were made in the late XIXth century and yet many of them represent mythical creatures made of the parts of multiple animals. The qilin has a fearsome appearance in order to frighten the wicked. 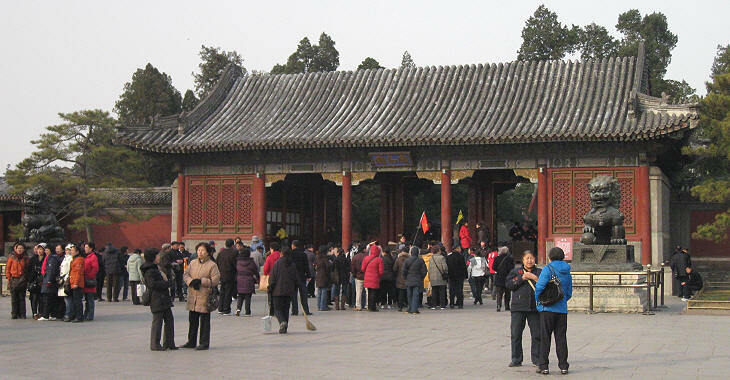 Today the Summer Palace is a very well kept park and a "must see" site for national and foreign tourists. Ordinary Chinese had no access when the Qing (Manchu) dynasty ruled the country (1622-1912). Eclecticism i.e. 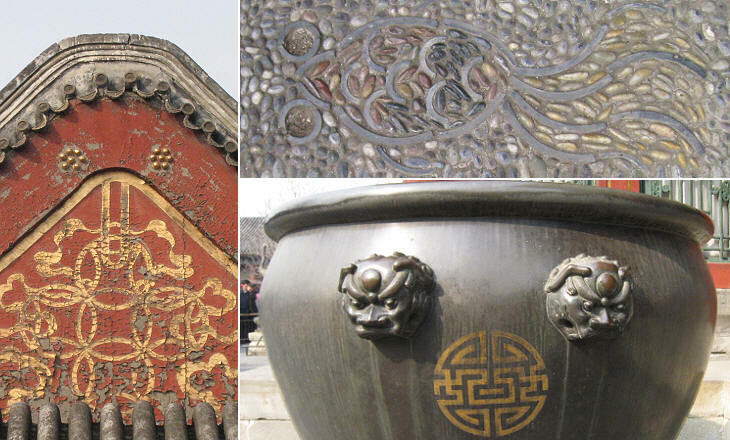 the combination of different styles or decorative elements characterized the art of the XIXth century in the Western world and it crept into the decoration of the Summer Palace (e.g. the rather naturalistic statue shown below). Also the representation of real animals was linked to their symbolic meaning: bats are a symbol of longevity and happiness and goldfish are a symbol of love and good luck.